As this blog post is being published David will be delivering his “Putting his Head in the Cloud – Working with SQL Azure” talk at SQL Saturday in Denmark. In preparation for his talk David has and over the last six to seven months been working on an eBook which he has decided to release at the same time he is delivering his talk. 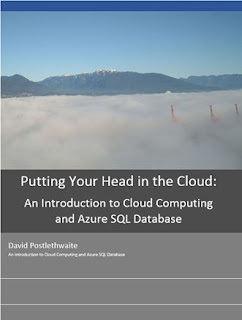 If you are attending David’s sessionand would like a copy even if you are not attending his session and would like a copy anyway you can download using the Free SQL Azure eBook link.